Alexandre Lacazette extended Arsenal’s unbeaten run to 14 games and dealt a blow to Liverpool’s quest to win the Premier League for the first time in nearly three decades by salvaging a 1-1 draw at the Emirates on Saturday. 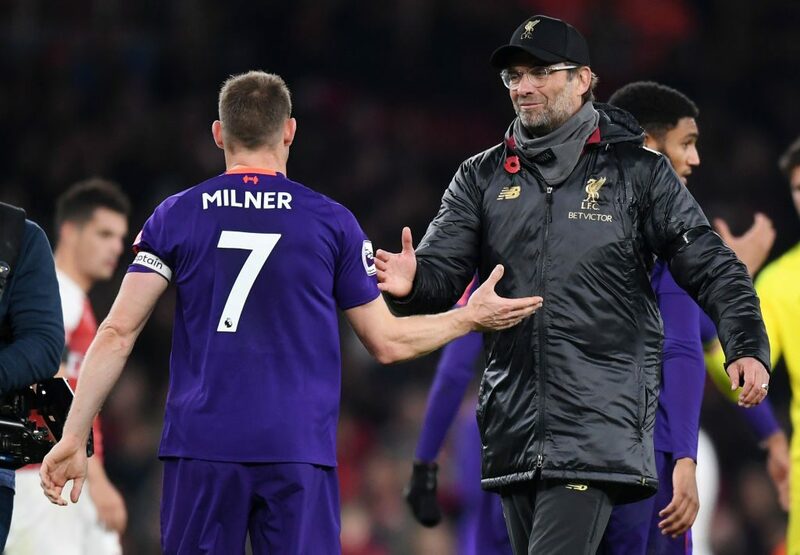 James Milner’s opener just after the hour mark looked set to send Jurgen Klopp’s men three points clear of champions Manchester City, who host Southampton on Sunday, at the top of the table. However, that lead is now a solitary point as Lacazette struck eight minutes from time to give the hosts a well-deserved point from an enthralling encounter. After a baptism of fire in defeats to City and Chelsea in his first two matches as Arsenal’s first new manager for 22 years, Unai Emery has impressively put his stamp on the Gunners. In contrast to their last visit to the Emirates when they conceded three times in five minutes, Liverpool needed to show their new-found defensive resolve as a confident Arsenal started the brighter. Alisson Becker spread himself well to block from Lacazette before Pierre-Emerick Aubameyang’s deflected effort from the edge of the area flew just wide. However, Liverpool also had plenty of chances in a thrilling first half that somehow lacked only goals. A dubious offside decision denied Sadio Mane the opening goal and Virgil van Dijk twice should have scored when he was first repelled by Bernd Leno and then flicked a header against the post with the German ‘keeper caught flapping. Leno didn’t get so lucky with his next mistake as he palmed Mane’s dangerous cross back into the heart of the box and Milner drilled into the unguarded net. Emery’s decision to sacrifice Aubameyang rather than Lacazette with his substitutions was vindicated when the French international kept his composure to brilliantly curl into the far corner after being forced wide by Alisson. Both sides poured forward in a frantic finale, but Klopp’s decision to withdraw Mohamed Salah for Joel Matip in stoppage time showed the German was happy to protect Liverpool’s unbeaten league start. A return of five points from a possible nine from visits to Chelsea, Spurs and Arsenal is already a drastic improvement on Liverpool’s record of a single point from away games against top six opposition last season.